A couple of weeks ago, I had the pleasure of shooting photos for Glow Organic Brighton. 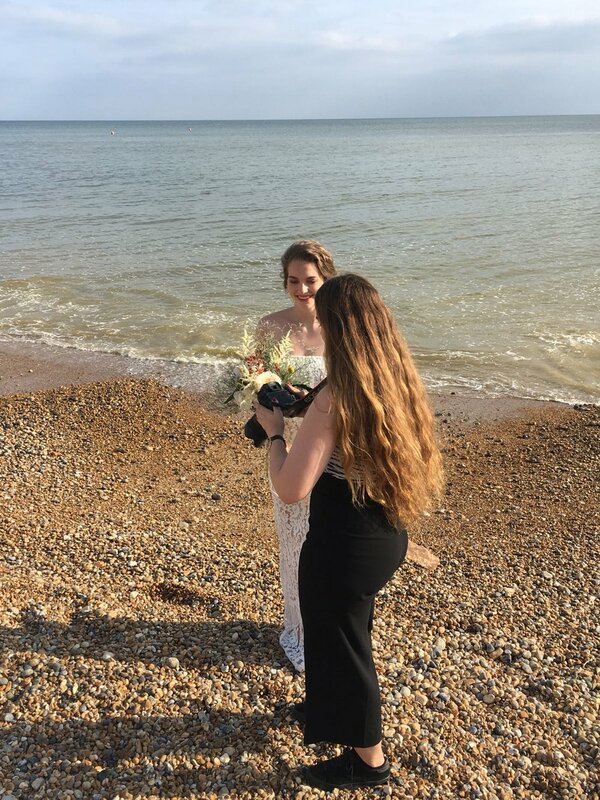 We did a styled bridal shoot, by the beach just outside Brighton on a sunny evening. I’ve known the owner, Mel Jenkinson, makeup artist and owner of an online shop for organic makeup, for quite a while since one of my previous regular clients worked in the same office space as her. I’ve always loved Mel’s style of makeup, soft, natural and glowy so getting the opportunity to shoot it, in such a beautiful environment and super talented models, was amazing, to say the least. Alongside with Mel, was Isabel Plett, a German makeup artist who had a similar style. One thing I love about Brighton is that so many people are actively working towards making their businesses and lives ethical and sustainable. Mel is one of them, and I recommend all of you who wear makeup to check her website out. Isabel took some behind the scenes photos I thought I'd share, I always love behind the scenes material and seeing the setting images were made in! The photos from the shoot are in a gallery in my portfolio here. Our stunning models for the day was Isabella Lilley and Emily Anderson.